The landscapes of South Dakota. The magic hour on the Texas prairie. The all-powerful nature of Guadalcanal. The strange beauty of a new world. The cosmos staring back at a family. The drifting of romance among the terrain. Now Malick brings us to the modern world of Hollywood as his quiet screenwriter Rick (Christian Bale) wanders through studio back lots, parties, strip clubs, and fancy smancy houses. If you're somehow unfamiliar with the work of Terrence Malick then I suggest working your way through his filmography before diving into this modern motion poem of the Hollywood dream factory. Slowly Malick has been fine-tuning his art and for better or worse, has stripped away common elements of narrative film. His last two works, and this one, are not narratives but rather personal memories from Malick himself that he's recreated in evocative images and whispers of dialogue. The Tree of Life (2011) has grown in my mind to be a flawed masterpiece and works as a bridge from his earlier more narrative driven films and his new abstract quandaries. Where To the Wonder (2013) felt like an experimental seed planted by The Tree of Life, this film has roots and begins to grow branches of profundities. This film posits itself as a fable. A monologue tells us of a king who sent his son to a city to find a pearl but when he reached the city he was given a cup to drink and he forgot about the pearl and that he was the son of the king. Malick modernizes this tale to be about a screenwriter (likely a stand in for himself) who heads to Hollywood and forgets who he is. Malick and Lubezki shoot Los Angeles as an otherworldly planet. LA hasn't been so uniquely photographed since Mulholland Drive (2001). This is also the most elliptical Malick film yet. It's a thousand 6 second art Vines edited together which makes Malick a pretty hip dude. Malick's Hollywood people speak and move almost like alien creatures. It feels distinctly European and heavily influenced by Fellini's 8½, another film about a man lost in a creative world. 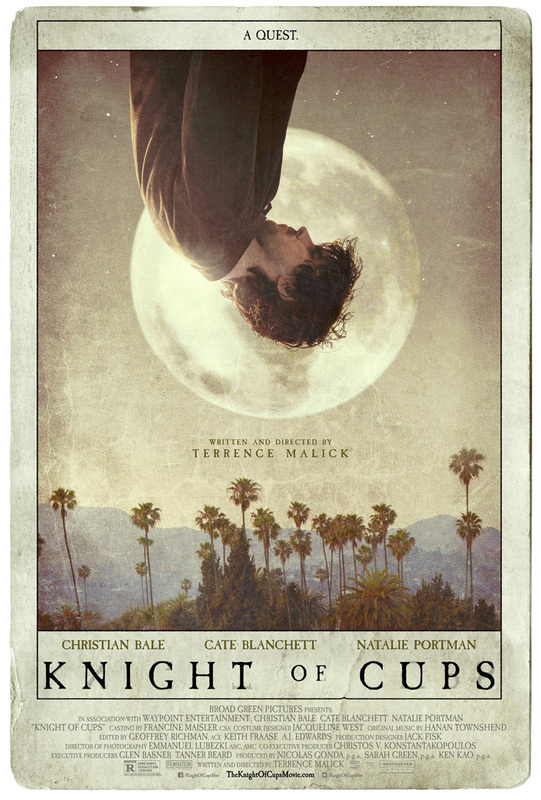 Knight of Cups is split into chapters as Rick drifts through time in LA, which gives the film a literary feel and a mythic presence with titles like "The Hanged Man" and "Judgment." Rick is lost amidst the glamour of Hollywood and Bale without words is able to emote the hidden longing of his initial quest that he's forgotten. Along the way women enter his life like ghosts from A Christmas Carol. Cate Blanchett, Teresa Palmer, and Natalie Portman are his angelic guides. I can't help but wish Malick would've given the film a more concrete shape to let Bale become an accessible character and less of a surrogate, but I suppose that'd be a different film. Rick's character is built through Malick's camera, which is all about POV. In Malick's world, character is setting, location, movement, and gestures. Plot and character beats are traded for images working as metaphors for Rick's mental state. 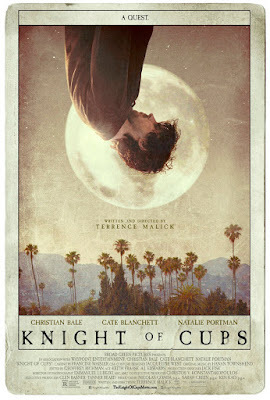 The essence of Knight of Cups is a modern man searching for himself. At times I felt it with the impressionistic marriage of music and elliptical editing gliding through beautiful images and wistful gazes that rips through to a place existing somewhere between memories and subconscious. It's a fleeting but overwhelming feeling… and this is something that only Malick and a few others can do. But often Malick's wandering fable begins to be like walking through an art gallery. It can be frustrating but you admire the visuals and then BAM you see something that you connect with. The legend of Malick emerges in Knight of Cups when it's focused on Rick's longing to return to the life he's lost. Sadly, the ambition of Malick is often criticized as "pretentious" or even worse, "hollow," but that is hollow criticism. His ambition reaches for the deepest parts of you and even if half of it fails it's a success and that's what Knight of Cups is. The repetitive and aimlessness often overwhelms the moments when Rick does latch on to a relationship or some semblance of narrative. But Malick is searching for the indescribable moments and the roots of emotional grounding are what decide how strong his films are. Knight of Cups is centered enough on a conflict that it's able to wade through it's ocean of images until it finds a wave of emotion. Malick is delving into personal and abstract musings, which unfortunately will diminish his legend for some. You could call it stubbornness but I find it admirable that he simply does not care whether you connect or not. No one else makes films like this. There's something special about watching art so utterly personal even if it's not satisfying. It's like finding a person's diary and viewing passages of their time on this rock floating through space and time. To watch a Malick film is to experience another person's memory. Is that not some sort of magic? Knights of Cups was released in the USA on the 4th of March. It will be released in the UK on the 6th of May.